Product prices and availability are accurate as of 2019-04-18 07:43:22 UTC and are subject to change. Any price and availability information displayed on http://www.amazon.com/ at the time of purchase will apply to the purchase of this product. 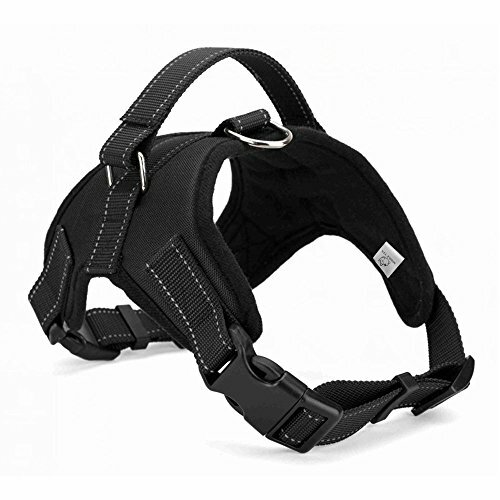 The Dog Harness is a wonderful mobility aid for dogs! Being outside can improve and lift your dog's spirit. This harness can help your dog enjoy the outdoors and if at some point they need help, the harness has a support handle to help you carry or lift your dog. This product does have sizing guide, so please mak sure you review the guide if you are wanting to purchase this product. *Harnesses are more comfortable for dogs than a leash being tied to the neck collar. Dogs hate being pulled by the neck and usually force them to rebel. *The dog harness is made of high quality oxford/neoprene with soft padding interior ensuring your dog is comfortable, good for long period use! *The strap is adjustable fitting different breed well and two secure quick released buckles which makes it easy to put on and take off. *The No pull handle is connected with the body of harness providing the best stress point to control your excited friend. D-ring in the back can be attached to any leash for pulling /carting work with your dog (strong pull is not recommended). *The Reflective element of design will keep your dog safe even in the dark circumstance. A good gift for your dog. please kindly check the measurements before you place order.